Winter is a difficult time. A time when light and shadow do battle, and a time for silence and patience. A few faint signs of prehistoric man’s obscure fascination with the season echo even today. Handed down over the ages, the myths and ceremonies at the heart of winter festivities reflect the mysterious and intense relation between man and winter. The great cycle starts in November with masks popping up in the valleys, drawing the spirits of the dead and as yet unmarried young people into a joyous medley of ancient rites and religious beliefs intended to ensure fertility and prosperity. From the Mediterranean Alps to Slovenia, uncountable masquerades and fêtes mimic the old rituals whose profound meaning has often been forgotten. Devilish harlequins and ephebic figures lead the procession of masks in the Ladin valleys. These festivities, eliciting wide participation in South Tyrol and the Dolomites, have roots going back to a vaguely perceived mix of myths and rites, beliefs and traditions. The participants, however, could not care less. These carnivals are above all the best available means to assert their cultural identity. A bizarre ceremony marks the end of the carnival festivities in the Southern Alps. The enacted burial of the carnival king also symbolises the traditional end to life as a bachelor. This burlesque ritual highlights the roles of young people in village communities. * Kober-dada adaptation of the Marcel Duchamp painting, La mariée mise à nue par ses célibataires même, in english : The bride stripe bare by her bachelors, even. Between Noel and Epiphany, the « cycle of the Twelve Days » marks the beginning of winter. A time of intense religious celebrations, this festive period is also rich in regional customs, among which the preparation and sharing of traditional dishes are an important part. A look at the Savoyard regions. Are renewed traditions but a new manifestation of our modern times ? In many Alpine villages, the old festivities have been dusted off and put back into active service (though some would say simply enacted) by small groups of dynamic inhabitants. Adapted to our times, they have (re)established certain bonds within communities. Though they sometimes stray excessively close to dubious folklore or simple media events, these carnivals and other festivities paradoxically constitute a refuge from modernity. Both men and the living creatures of nature feel the sap rise as spring approaches. The result is bellowing and bawling, bonfires and fun. In the Trentino, the young people indulge in an original and impertinent hullabaloo called the tratomarzo, an old pagan (and wanton) tradition of which bits and pieces still remain, though sometimes simply as a tourist attraction. 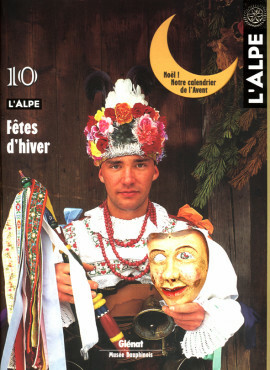 The emblematic masks of the Lötschental, in the Valais, have now been promoted to the dubious status of souvenirs and the carnival would seem to have lost its heart and soul. But the terrible Tschäggätä refuse to become a simple tourist attraction and the young folk have breathed new life back into the wild festivities. Just to make sure the fun and the craziness continue. Beheld from high atop the Mantelinha, the world is anything but a valley of tears. And in January, when from up on the summit the entire world is nothing but immaculate snow, anyone whose soul is not irrevocably barred to beauty, even a shepherd whose sheep far below in the stable cry out in hunger, might have to admit that the world was perhaps created just to make possible such blinding whiteness. A short story. Among the many stereotypes in Alpine tourism, snow globes are in a class all by themselves. From the cute chamois to the brightly clothed skier, cable cars, wooden chalets and Santa Klaus, every cliché pertaining to mountains has, at one time or another, been bottled up in the small globes made of transparent plastic. The ultimate in kitsch, snow globes have also occasionally been used by major artists as a back-handed form of tribute to the original creators of souvenirs. A trip down souvenir lane. A tremendous chain of mountains, inhabited by Kirghiz nomads and far from any beaten path, constitutes a part of the far-flung boundary between Kyrgyzstan and China. At the beginning of the century, a few rare Westerners travelled there, equipped with imprecise maps and looking for new summits to climb. Among them, an Italian group, made up of a prince with his guide, accompanied by an ethnologist from the Aosta Valley. A century later, two of their compatriots went the same route in the mysterious Tien-Shan. Art, art, wherefore art thou ? The « Traversées » exhibition was set up in the Ecrins national park, for the short summer season. Five contemporary artists (a photographer and four writers) temporarily installed their works along the trail from La Bérarde to the Châtelleret refuge, in the heart of the highly protected central zone of the park. That was deemed sacrilegious by many and the result was a passionate debate and an impressive number of contradictions. An inquiry.